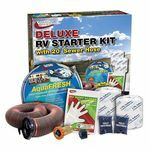 K88108 Deluxe Accessory RV Starter Kit - Make the first trip out for the new RV owner a hit with some of the basic needs. This Starter Kit includes the essential items to make sure the first trip is a positive experience. Deluxe Kit Includes: 1 - 4 pack toilet paper, 1 - 25 foot drinking water hose, 1 electrical adapter, 1 water regulator, 4 - 2 oz dry RV Trine Holding Tank Treatments, 1 - 10 foot drain hose with straight hose adapter, 1 Bubble level, 1 Bag of disposable RV dump gloves, 1 coupon book.